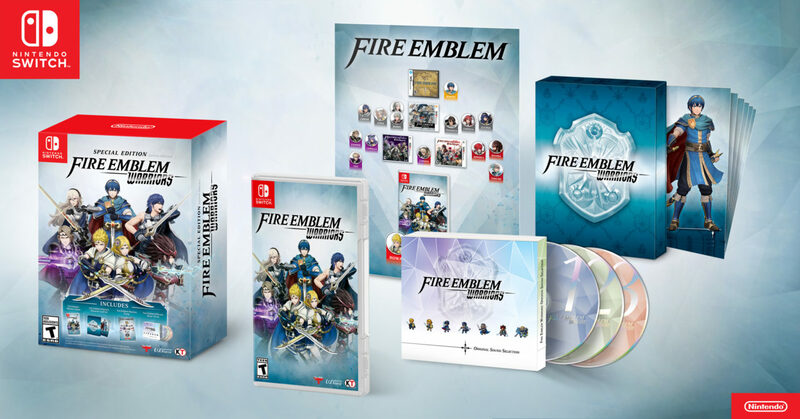 REDMOND, Wash.–(BUSINESS WIRE)– During the GameStop Expo in Las Vegas, Nintendo announced a special edition of the Fire Emblem Warriors game for the Nintendo Switch system and a dual pack of the Pokémon Ultra Sun and Pokémon Ultra Moon games for the Nintendo 3DS family of systems. Both will be available this fall in the Americas, and will come with a variety of items sure to provide game fans with lots of additional entertainment. This special edition comes with the Nintendo Switch game, plus three CDs with music from the game. Fans also will receive character art cards on 5-by-7-inch premium card stock, and a slip case to hold the cards. Finally, the special edition will come with a dual-sided poster showing the first Fire Emblem games the characters appeared in. One side of the poster will be in English, while the other will be in Japanese. The special edition for Nintendo Switch goes on sale Oct. 20 at a suggested retail price of $79.99, the same day the game launches for the Nintendo Switch and New Nintendo 3DS, New Nintendo 3DS XL and New Nintendo 2DS XL systems. For more information about Fire Emblem Warriors, visit http://fireemblemwarriors.nintendo.com/. This dual pack, which will be available at select retailers, includes both the Pokémon Ultra Sun and Pokémon Ultra Moongames for the Nintendo 3DS family of systems, as well as 16 art cards. Fans also will receive a digital download card for 200 Poké Balls. This special dual pack goes on sale Nov. 17 at a suggested retail price of $79.99. For more information about Pokémon Ultra Sun and Pokémon Ultra Moon, visit http://pokemon.com/ultrasunmoon. Remember that Nintendo Switch and Nintendo 3DS feature parental controls that let adults manage the content their children can access. For more information about other features, visit http://www.nintendo.com/switch or http://www.nintendo.com/3ds.